From late 2008 to early 2012 roughly one third of every mortgage holder in the United States was underwater (the mortgage on their home was higher than the price of their home). 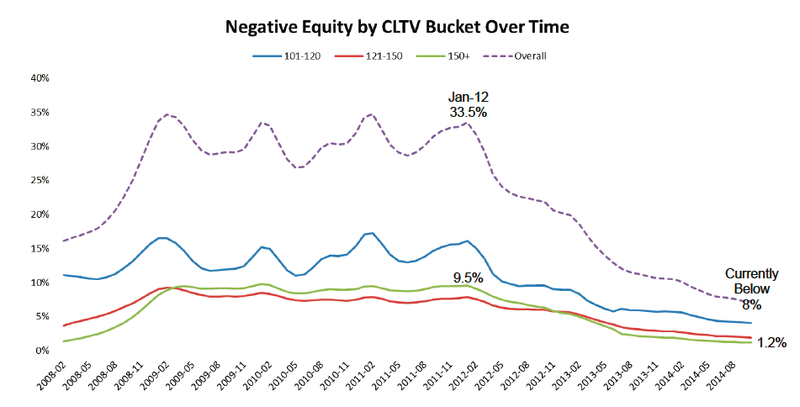 With home prices bottoming in early 2012, the number of underwater mortgages has steadily declined to under 8% today. The remaining 8% represent 4 million Americans which are underwater by an average of $39,000. This is great news for many Americans who were formally trapped within their homes, but what is the long term cost the U.S. will endure to achieve this short term economic boost? The government has become the mortgage market through Fannie Mae, Freddie Mac, FHA, etc. This has allowed new borrowers to continue borrowing with low down payments and sub-par credit and income levels. I understand conditions are tighter than they were in 2006, but they are far looser than where the free market would have set them following the 2008 crash. The Federal Reserve entered the market in early 2009 and has been purchasing hundreds of billions of dollars worth of mortgages over the past five years. This pushed mortgage rates down to all-time record low yields; far below where the free market would have set interest rates on mortgages. If these two actions were not taken home prices would have fallen much further; down to a level where the free market would feel comfortable lending to home owners based on their savings, income and credit criteria. With home prices far lower a hypothetical new buyer entering the market today would only need to borrow $100,000 for a quality new home for their family, instead of perhaps the $300,000 that is actually needed. That extra $200,000 in debt could have been used over the next 30 years to save, re-invest in the economy, or purchase other goods (also growing the economy). It should be obvious with the government and Federal Reserve "all-in" there is only one direction we can go. If the government were to step away from the mortgage market in any capacity or if the Federal Reserve were to ever let mortgage rates rise again, home prices would immediately assume their downtrend. Even with full government support in place home prices are beginning to slow and even turn down in many areas. Was it all worth it? I guess it depends on who you ask. 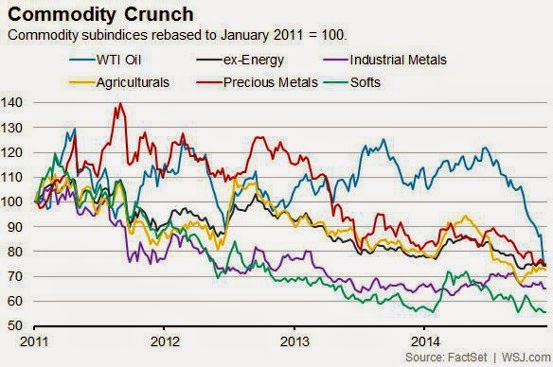 The chart below provides an excellent visual on the four years of commodity pain. After out-performing the rest of the commodity space over the last two years, oil has "caught down" to the rest of the crowd. As readers know I've been a steady buyer of precious metals and agriculture over the last 18 months and following the recent carnage in the oil market I've become a buyer in that space as well. See: Oil Price Collapse: Buying Opportunity? In those three markets prices are low, sentiment is catastrophic and long term fundamentals are incredible. It doesn't happen often when you get all three to align as it did with Chinese stocks back in late 2012 (unfortunately the Chinese market is now about 37% higher and positive sentiment has returned). 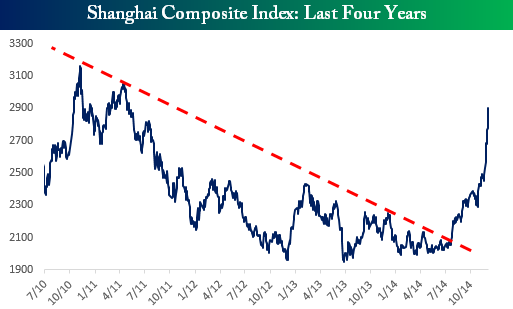 See China's Stock Market Continues To Plunge: Buying Opportunity? "The stock market does not reflect what's going on in the economy. Holding cash is better than investing in an over-valued stock market." "Meanwhile, the S&P 500 is more than double its historical valuation norms on reliable measures (with about 90% correlation with actual subsequent 10-year market returns), sentiment is lopsided, and we observe dispersion across market internals, along with widening credit spreads. These and similar considerations present a coherent pattern that has been informative in market cycles across a century of history – including the period since 2009. None of those considerations inform us that the U.S. stock market currently presents a desirable opportunity to accept risk. As was true at the 2000 and 2007 extremes, Wall Street is quite measurably out of its mind. There's clear evidence that valuations have little short-term impact provided that risk-aversion is in retreat (which can be read out of market internals and credit spreads, which are now going the wrong way). There's no evidence, however, that the historical relationship between valuations and longer-term returns has weakened at all. Yet somehow the awful completion of this cycle will be just as surprising as it was the last two times around – not to mention every other time in history that reliable valuation measures were similarly extreme. Honestly, you’ve all gone mad." The Buffett indicator of stock market under/over valuation reached a new post 2009 high at 131% in November. The indicator measures the market cap of U.S. stocks to GDP. It is rapidly closing in on the mania peak reached in 2000. 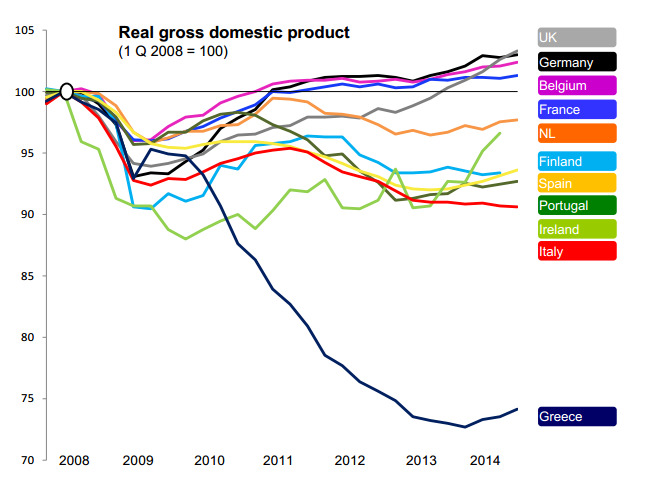 Will it get there before gravity returns? U.S. stocks have now become 37% of total global market capitalization. Japanese stocks made up 42% of the global market in 1990 (the previous record) before they collapsed and fell for 23 years. 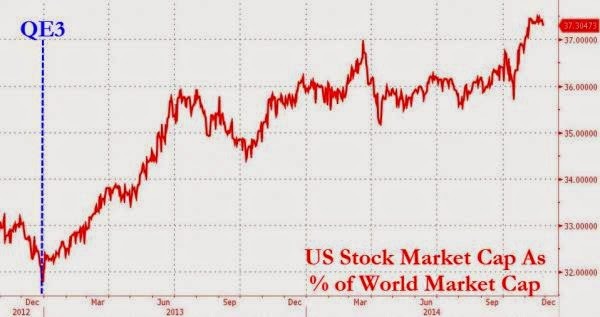 Here is the US stock market performance vs. the rest of the world. After 10 years of foreign stock out performance following the 2000 top, U.S. stocks have been outperforming the world by a wide margin since 2011. Will this data set mean revert again? 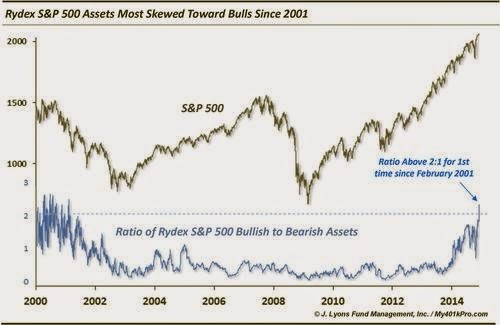 The amount of assets in the Rydex S&P 500 bullish fund is now double the amount in the bearish fund for the first time since February 2001. While investors have moved all in U.S. stocks betting long, everyone has given up betting against a decline. This becomes important as stocks put in their top because short sellers are needed to slow market declines (they lock in profits by buying back stocks they borrowed/sold on the way down which slows the market decline with their purchases). If there are no shorts, then the market has the ability to experience a waterfall decline. Over the weekend Bitcoin passed the 1 year anniversary of its now famous top. At the end of November last year it crossed $1,240 and surpassed the price of one ounce of gold. There were countless projections during those frenetic November weeks about how Bitcoin would soon push toward $1 million. I wrote an article that day titled Bitcoin Pushes To $1,240 Taking A Ride Out To The South Seas. 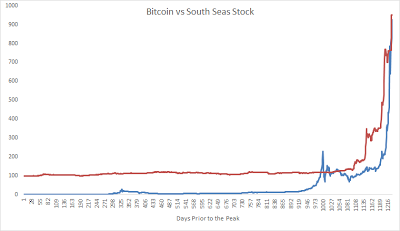 I put up this chart showing the correlation between Bitcoin's rise and the famous South Sea Bubble during the early 1700's. One year later Bitcoin has collapsed down to $380, and almost no one talks about it anymore. To be honest, I'm surprised it is still that high. I would have preferred to purchase one ounce of gold when it was equal to Bitcoin at $1,240, but gold has also performed poorly over the last year, sitting at $1,200 as of this writing. Investors have found a new found love in paper currency during 2014, specifically the U.S. dollar. My guess is that over the next five years one of the major paper currencies (perhaps the Japanese yen?) will experience the same time of plunge Bitcoin has endured over the last 12 months.